Aim : The purpose of the study is to assess and compare compressive strength of newer nanocomposites (FiltekZ350, Ceram X Mono, Ceram X Duo) with microhybrid (Tetric Ceram) and to compare difference in compressive strength of newer nanocomposites. Materials and Methods : Forty eight specimens of composite were fabricated using customized biparpite brass mold measuring 5mm x 5mm and were grouped with twelve specimens in each Group I : Tetric Ceram, Group II: Filtek Z 350, Group III : Ceram X Mono, Group IV : Ceram X Duo. Composite resins are placed in cylindrical recesses and covered with mylar strip and are cured using QHL light curing unit. Compressive strength is evaluated using Instron machine. Results are statistically analyzed using One way Anova and Student t test. Analysis demonstrated that nanocomposites have better compressive strength than micro hybrid (P<0.001). Results : Within the limitations of the study, it can be concluded that nanocomposites have better compressive strength than microhybrid composite and nanocomposite showed optimal compressive strength of 312 - 417 Mpa. The aim of this study is to measure and compare the compressive strength of newer nanocomposites. 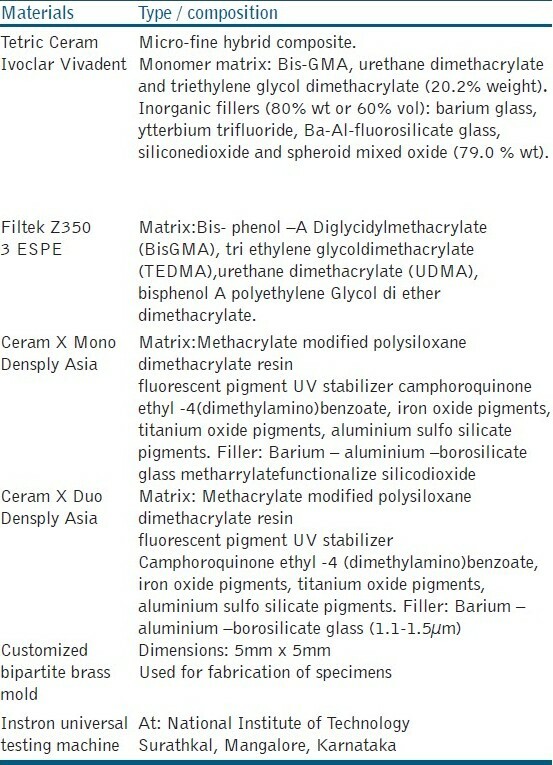 Materials used in the study are given in [Table 1]. Four groups are made of four different composite materials having 12 specimens in each group, thus fabricating 48 specimens using customized bipartite brass mold measuring (5mm Χ 5mm). The composite resins are placed in cylindrical recesses. The composites are covered with a mylar strip. A glass slide (1mm thick) is then placed over composites and pressure is applied to accommodate the material into the mold and to extrude excess material. After removing the glass slide, the composites were then irradiated from the top and bottom surfaces through the mylar strip as per the manufactures instructions using the QHL light curing unit. The specimens are taken out of the brass mould and light cured in the middle of the specimen at opposing sides. In total, 48 specimens are fabricated according to the grouping done. Study is performed in controlled temperature by keeping it in a distilled water bath for 24h at 370C. Data obtained in the present study is subjected to statistical analysis using one way ANOVA and inter group comparison is done using Student t test. The compressive strength of experimental groups is compared with one way ANOVA test, p value < 0.001 is obtained which indicates highly statistically significant difference between tested material [Table 2]. Further inter group comparison is carried out using Student t test. Results demonstrated that group I differed significantly only with group II (P value = 0.001); however, there was no statistically significant difference between group I and group III and group I and group IV with p values of 0.078 and 0.185, respectively [Table 3]. Group II showed significant differences with all the other 3 groups having a p value of 0.001 in all cases. No statistical significant difference was found between group III and group IV (p value is 0.490) [Table 4]. The latest development in the field has been the introduction of nano filled materials by combining nanometric particles and nano clusters in a conventional resin matrix. Hence in this study the compressive strength of nanocomposites is evaluated and compared with micro hybrid composite. Compressive strength is measured using Instron Universal testing machine. Tetric Ceram is a microhybrid, light curing, radiopaque fine particle hybrid composite for the restrorative therapy. Filtek Z 350 is a nano filled composite with a combination of nanomer sized particles to the nano cluster formulations which reduces the interstitial spacing of the filler particles. This provides increased filler loading, better physical properties when compared to composites containing only nanoclusters. Average filler particle size is 5- 20nm. Ceram X is a nano hybrid containing organically modified ceramic nano particles comprising polysiloxane back bone. These nanoceramic particles can be best described as inorganic - organic hybrid particles where the inorganic siloxane part provides strength and the organic methacrylic part makes the particles compatible and polymerizable with the resin matrix. The good resistance to micro crack propagation might be related to strengthening effect of the nano - ceramic particles. Average filler particle size is 10nm. In this in vitro study, Filtek Z 350 has the highest compressive strength and Tetric Ceram has the least compressive strength among the composites evaluated. Ceram X Mono and Duo had comparable compressive strength with that of Tetric Ceram. This study is in accordance with the studies done by Lu et al, Mitra et al, Beun et al. However, it is in contrast with the result discussed by Ruddell et al, who stated that pre polymerized nanoparticles have the potential to improve wear properties; however, there was reduction in mechanical properties as compared with conventional composites. The reason stated for this drop in the mechanical properties was micro cracking present in some nanoparticles which was introduced during impregnation procedures resulting in inbuilt flaws. The differences obtained between the various study groups could be explained by the nanofiller content (wt%). The results obtained in this study could be attributed to the differences in the shape, size and concentration of the fillers in the experimental groups. Nanocomposites have shown better compressive strength than micro hybrid composite. Filtek Z 350 has shown the highest compressive strength and Tetric Ceram has shown the least compressive strength among the tested materials. Among the nanocomposites, Ceram X Duo had the least compressive strength as compared to Ceram X Mono and Filtek Z350. Nanotechnology has helped to develop a dental filling material that will be used in all areas of the mouth with initial polish retention, as well as excellent mechanical properties suitable for high stress bearing restorations. Further in-vitro studies should be carried out to improve the knowledge of the mechanical behavior of nanofilled composites and in-vivo studies to determine their clinical performance. 1. Lu H, Lee YK, Oguri M, Powers JM. Properties of a dental resin composite with a spherical inorganic filler. Oper Dent 2006;31:734-40. 2. Mitra SB, Dong WU, Holmes BN. An application of nanotechnology in advanced dental materials. J Am Dent Assoc 2003;134:1382-90. 3. Moszner N, Klapdohr S. Nanotechnology for dental composites. Int J Nanotechnol 2004;1:130- 41. 4. Mota EG, Oshima HM, Burnett LH Jr, Pires LA, Rosa RS. Evaluation of diametrical tensile strength and knoop microhardness of five nanofilled composites in dentin and enamel shades. Stomatologija 2006;8:67-9. 5. Roberson TM, Heymann HO, Swift EJ. Sturdevants's art and science of operative dentistry. 5th ed. Amsterdam: Elsevier Publications; 2009. 6. Xu HH, Quinn JB, Giuseppetti AA. Wear and mechanical properties of nano silica fused whisker composites. J Dent Res 2004;83:930-4. 7. Beun S, Gloriex T, Devaux J. Characterization of nano filled compared to universal and micro filled composites. Dent Mater 2007;23:51-9. 8. Ruddell DE, Maloney MM, Thompson JY. Effect of novel filler particles on the mechanical properties of dental composites. Dent Mater 2002;18:72-80. 9. Ilie N, Kunzelmann KH, Hickel R. Evaluation of micro-tensile bond strengths of composite materials in comparison to their polymerization shrinkage. Dent Mater 2006;22:593-601. 10. Soh S, Sellinger M, Alan UJ, Adrian Y. Dental nano composites. Curr Nanosci 2006;2:373-81. 11. Atai M, Nekoomanesh M, Hashemi SA, Amani S. Physical and mechanical properties of an experimental dental composites based on a new monomer. Dent Mater 2004;20:663-8. 12. Kim KH, Ong JL, Okuno O. The effect of filler loading and morphlogy on the mechanical properties of contemporary composites. J Prosthet Dent 2002;87: 642-9. 13. Manhart J, Kunzelmann KH, Chen HY, Hickel R. Mechanical properties and wear behavior of light cured packable composite resins. Dent Mater 2000;16:33-40.